If you can dream it, you can do it for any reason! Finance College Tuition & More! The home must be located within the state of Indiana, and be owner-occupied. Up to 90% loan-to-value (including the first mortgage) on fixed and variable rate Home Equity loans and Lines of Credit. Call us at (765) 453 4020, extension 1348 or toll free (800) 999 5894. 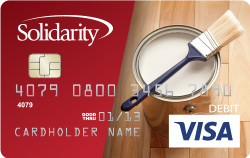 Solidarity's Home Equity Line of Credit has a Debit Card for convenient access to your Home Equity loan balance. Make purchases anywhere using your Solid Line Home Equity Debit Card! The funds are deducted from your available balance on your Home Equity Line of Credit loan. Order your Solid Line card here or email loandesk@solfcu.org. *APR is the Annual Percentage Rate. Fixed and variable rates are available. Some restrictions apply. Rate is based on applicants credit history. Applicant must carry insurance on property that secures plan. Flood insurance may be required if applicable.